Blog Energy Efficiency & Reducing Utility Bills	Solar Heat Gain: What is it and how does it affect your home? Solar Heat Gain: What is it and how does it affect your home? Have you noticed that some rooms in your home get hotter during the day than others? To find out why, look at which direction the windows in the room face. 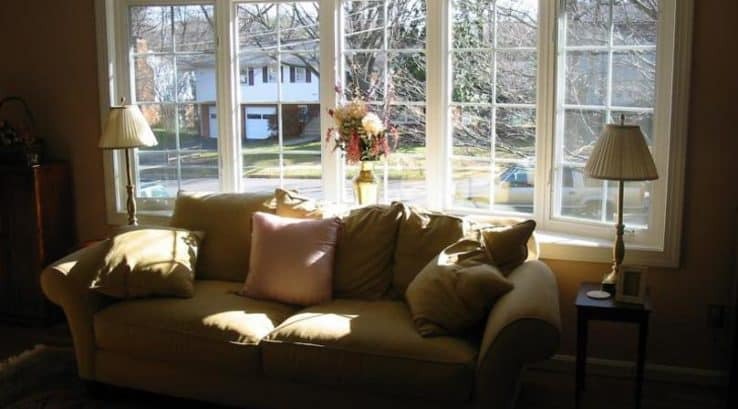 South and west facing windows get more direct sunlight, therefore those rooms tend to get warmer. The term for this is solar heat gain, or SHG. While SHG is desirable in the winter to warm up chilly rooms, it’s an unwelcome side effect in the strong summer heat. Let’s talk the science behind solar heat gain first. SHG heats your home through the radiation produced by the sun. Objects that are hit by direct sunlight, such as window glass, absorb this solar radiation. The amount of radiation that is absorbed or passes through a window is called solar heat gain coefficient, or SHGC. This coefficient is expressed as a number between 0 and 1, with a lower number indicating less solar heat is transmitted, and a higher number meaning it’s more effective at heating a room via solar heat gain during the winter. Now that you know what solar heat gain is, you can more effectively control how it affects your home. If a room in your home gets too hot during the summer, SHG is often the culprit. To minimize the amount of solar heat entering the window, select the correct window treatments for those windows. Blinds and shades allow you to cover the windows during the hottest part of the day. Adjustable shades can be opened slightly so light can enter between the slats but still block direct sunlight. Cellular shades improve the energy efficiency of your windows since the heat gets trapped in the honeycomb pockets within the shade. And the window itself can make a difference. Not all windows are created equal. Certain types of glass and coatings make the window more efficient at blocking heat gain from the sun. Single pane windows are the least energy efficient since they allow sunlight to pass directly through them. Double pane glass acts as a barrier by trapping heat between the two panes. Low-e stands for low emissivity, and low-e coatings on window glass reflect solar radiation that hits the glass while still allowing visible light to enter the room. If your windows are older, damaged, or not energy efficient, new replacement windows will make an immediate improvement on the comfort and efficiency of your home. Now that you know the role solar heat gain plays on a window’s performance, how do you know which window to select? ENERGY STAR has made this straightforward by placing a label on all ENERGY STAR-certified windows. These windows are independently tested and verified to meet strict energy efficiency guidelines determined by the U.S. Environmental Protection Agency. The ENERGY STAR label lists the solar heat gain coefficient for each particular climate zone. All of Virginia and Washington DC fall within the North Central Zone, as does the majority of Maryland (with the exception of the far western portion of the state). For that zone, ENERGY STAR recommends a SHGC of 0.40 or less. Now that you are armed with this new knowledge about how solar heat gain affects the temperature and comfort of your home, you can take steps to improve energy efficiency. Window coverings can help diminish the amount of solar radiation entering a room. And if you’re in the market for new windows, selecting ENERGY STAR-certified windows will help ensure maximum energy efficiency.